Victory in marketing does not happen when you sell something, but when you cultivate advocates for your brand." Advocates are your most informed customers. They've gone through your purchase funnel and understand your product and its value. Compare this to new customers just finding out about your product. Asking them for a referral is a little like putting the cart before the horse. They may not know enough about your product yet to feel confident about telling other people about it. But advocacy doesn't happen overnight. Someone might share your product once and then forget about it. To avoid this, put together a well thought out lifecycle referral campaign that brings people back to your referral program and turns referring into a habit. A lifecycle referral campaign helps you plan, in advance, how to nurture your customers with the right message at the right time to build up advocacy and sharing.The email sequence in the campaign will show you where and how to optimize your referral program. Awareness and first referral: To get customers excited about your referral offer, the first email should be an invitation to get involved. This email not only lays out the offer and the benefits of sharing, it's the gateway into the loop. Consideration: To keep customers in the loop, the next step is the reminder email. Customers might be on the fence about sharing so this email gets them to consider the value of the offer and what they get out of sharing. Follow-up: Next, when customers start sharing, follow-up emails encourage them to stay in the loop. A thank you email acknowledges customers for taking the time to share and gives them the boost they need to keep sharing. Confirmation and motivation: The next two emails in the sequence are the reward and scoreboard emails. They confirm the progress customers have made so far with their referrals by showing their rewards to date and what their referrals are doing. These emails motivate customers to keep sharing to see even more results. But that isn't the end of the loop. It starts again with the reminder email because the ultimate goal is to keep customers in the cycle. Let's take a deeper look into each type of email and how to use them to create sustaining customer acquisition loops. A lifecycle referral campaign helps you plan, in advance, how to nurture your customers with the right message at the right time to build up advocacy and sharing. You need to get customers into your referral funnel to get the sequence started. Some advocates will bump into a referral offer on your website or see an ad on social media. But, you can also get advocates to refer people by emailing them an "invite email." The purpose of the invite email is to introduce the offer and explain what's in it for the advocate. Plus, it acts like a gateway into the funnel. It's short, simple and gets right to the point. The reward, free socks, is the first thing customers see. Then the email briefly outlines the process and ends with a big call-to-action button. For your invite email, instead of using "click here" for your CTA, use phrases like "get your link" or "get your free product." It's not only clear what you want customers to do, but it references what they need to do to enter the referral funnel. For example, they get a link to start sharing. People won't always bite the first time you ask them to refer so include your referral message in other marketing and sales emails. For example, if you send a new product update email, include a referral reminder in the email footer. It's subtle but keeps referrals top of mind for customers. Another approach is to make general referral emails time sensitive. 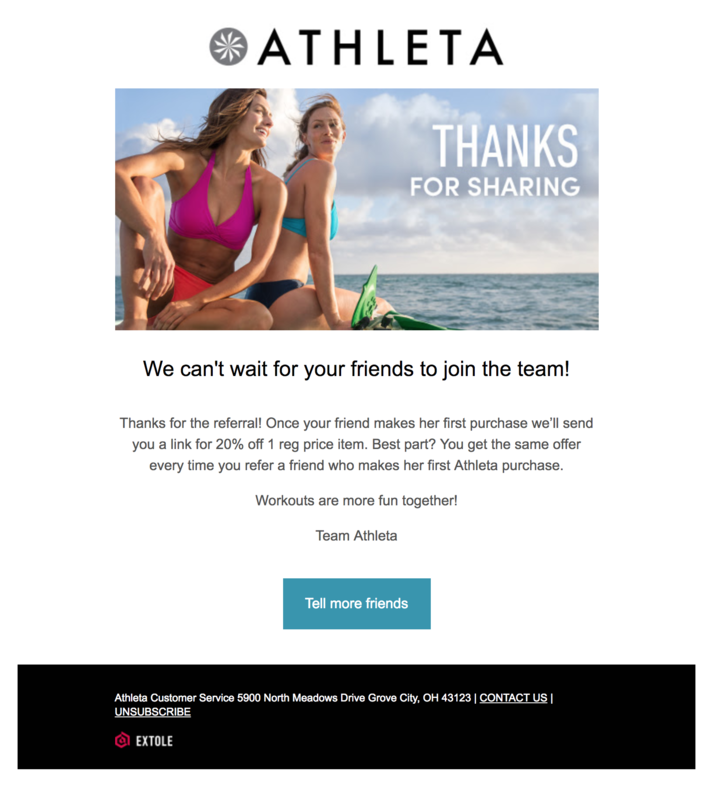 Here are two examples of reminder emails and how to use them to get customers to enter the referral funnel after the invite email. Use a less direct approach and add a refer-a-friend banner at the bottom of marketing emails. 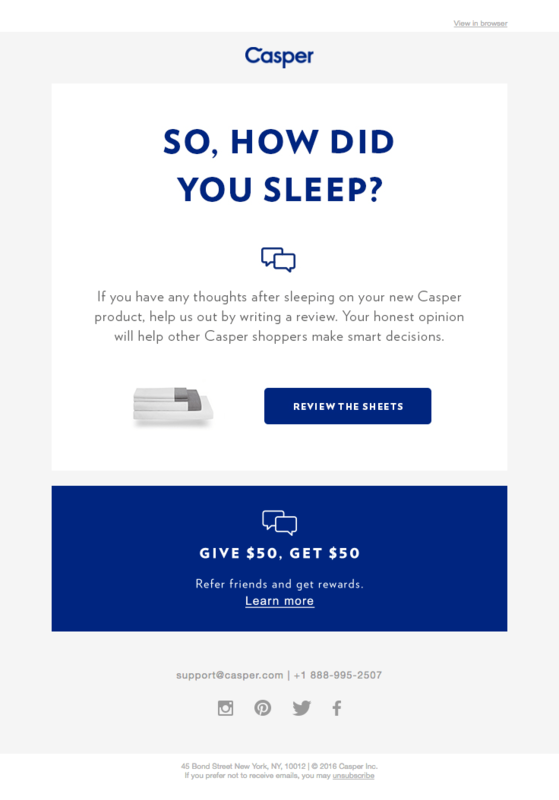 In this example for Casper mattresses, the focus of the email is to ask customers for a product review. The referral request shows up at the bottom of the email, with a separate CTA — “Learn More”. With this approach, make your referral bold so that it stands out from the rest of the email. You want attention drawn to it. Keep the message simple, just a few words, to pique interest and get customers to consider following through. Add a little incentive by encouraging advocates to refer more than one friend and highlight the benefit to them. For example, the more people they refer, the more they can save. Get people to take action and enter the funnel by making the offers time sensitive. For example, ask advocates to refer a friend by a deadline in order to save money or get a discount. With the UberEATS referral email, anyone who refers a friend over the course of a weekend saves $20. What they do well is they include enticing pictures and a summary of what advocates stand to gain. UberEATS includes a list of recommended restaurants for customers to try. It's one thing to ask for a referral but it's another to get people to actually do something. For the sense of urgency strategy to work, use social proof, like testimonials from people who've acted quickly and the benefits they've seen. Emphasize the rewards the advocates lose out on when they don't act right away. UberEATS plays up the savings, $20 up from the usual $10. A sense of urgency also works well on social media. Run referral offers where customers spend most of their time to attract more of them to your email loop and grow your customer base. Once customers enter the referral funnel, you need a way to keep the conversation going. Customers like to feel good about completing a task or a process, so say thanks to show your appreciation. It also gives you a chance to remind customers about what comes next in the process and their potential reward. With the thank you email, you boost the customer experience and give them a little nudge to stay in the funnel. You can also use thank you emails as an opportunity to get people to share with more friends. When your advocate enters the loop by clicking a CTA in a referral email and shares a link. When one of your advocate's referrals signs up, buys something or completes a process. With either of these options, make sure you send your advocate a post-referral email. Use your thank you referral email as an opportunity to encourage advocates to keep referring. Instead of a text link embedded in the body of the email, use a CTA button that stands out from the rest of the email. Also, make it clear what the next steps are. For example, if the reward depends on whether a referral buys something, confirm when advocates will get their savings. After all the work your customers have done, you want to keep the hype going and get them excited about the offer. Pull all the information you've learned from your customers and show them the amazing job they've done so far. Give them a behind the scenes look into what their referrals are doing. This sneak peak keeps them in the funnel and pumped to keep sharing. The more positive reinforcements they have, the better the chances of them sticking to the cycle. Confirm that your advocate's friends are following through on the referral offer. You motivate your advocates to keep sharing because they can see results. In the email, emphasize the benefits the advocate now has access to. 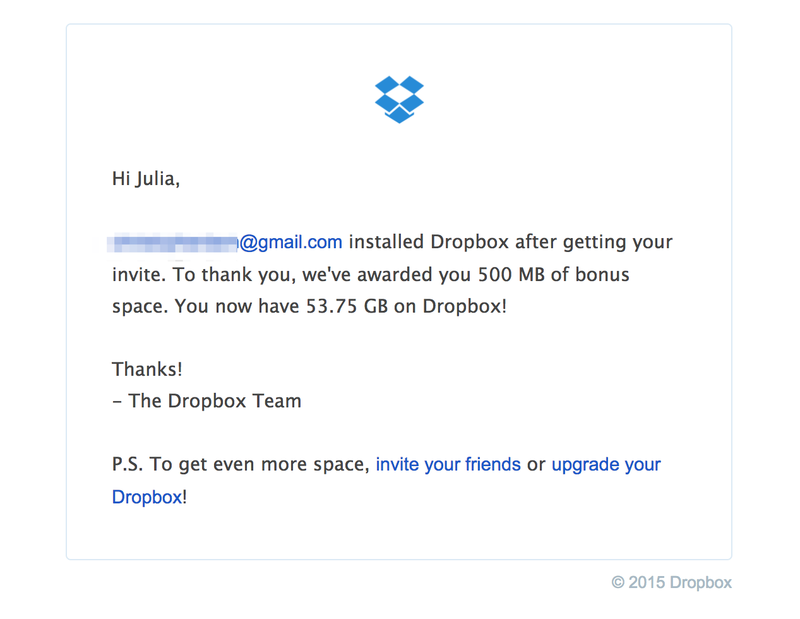 Dropbox struck referral email gold with their access to extra storage offer. In this example, they let advocates know who installed the app as a result of the advocate's referral. They go one step further and show advocates how much extra space they get as a result. This is brilliant mainly because customers like to see the progress they're making. The email ends with an ask to continue referring in order to get even more space. Dropbox has one of the most popular referral programs because it does a good job of keeping customers on track within the funnel. Just like with the thank you email, the reward email is the push advocates need to keep moving through the email loop you've created. They've put in work so give them a snapshot of what they've gotten out of the process so far. You can send these intermittently, like once a month, if advocates do a lot of sharing. Or, you can send them every time your advocates' friends do something. Meaning you only send periodic, relevant emails. At the end of the funnel are people who've followed through and shared at least one referral. Give them a high-level summary of everything they've done and the result of that. Give them a dashboard that highlights stats like how many referrals they've sent in the last month, how many people followed through and how much money the customer saved. The purpose of the dashboard email is to get customers to keep sharing and cycling through the funnel. Do this by gamifying their referral “stats” and highlighting milestones. It adds some fun to the process and makes it easy for customers to keep pushing themselves to get more results for the next scoreboard report. This shows where they are in their referral journey and motivates them to keep sharing. TheSkimm, a service that delivers a news summary to subscribers everyday, uses the scoreboard approach. Their dashboard email highlights key milestones like how long the advocate has been a subscriber and how many referrals they've shared. It ends with another CTA asking subscribers to share for a chance to win $1,000. Show how many people have used their referral link and the advocate's total savings to date. Use this email as an opportunity to share milestones with customers to highlight how far you've come together. This nurtures the relationship and helps to keep advocates engaged and motivated to not only keep using the product but to share it. Even though this is technically the last step in the loop, it encourages advocates to keep sharing. As they do, advocates go back to the reminder email phase and move through the funnel again. The point is to use this as an opportunity to get advocates to share and keep them engaged by offering a new reward. Once you've set up a way to identify your brand advocates and a loop that maintains itself, your customer base will grow automatically. The key is to use these different email types to always encourage advocates to keep sharing. For the loop to work, referrals need to be constant. Advocates can't share once and then move on. It has to be built into the fabric of your customer acquisition strategy. Once customers enter the loop, use this referral email sequence to keep advocates engaged and motivated. It's also a good opportunity to listen to their feedback so that their experience ensures they're happy and willing to share. For the loop to work, referrals need to be constant. Advocates can't share once and then move on. It has to be built into the fabric of your customer acquisition strategy.